A Farewell to the Set of "How I Met Your Mother"
It pains me to even think about it, but tonight the series finale of "How I Met Your Mother" will air. Take a moment to shed a silent tear. I figured what better way to say goodbye to one of the best comedies of all-time (if you've never watched, do yourself a favor and do so immediately) than to take a look back on its sets. There doesn't appear to be any official photo documentation of the HIMYM sets on the internet, so pardon the mish-mash of photos; I did what I could. I'll start off with a floor plan of Ted Mosby's apartment, courtesy of the very talented Iñaki Aliste Lizarralde, whom I have to thank for the creation of great-looking floor plans for several of my favorite TV shows. Great rendering, isn't it? (Head to Lizarralde's Etsy page to purchase this and other TV favorite floor plans!) Ted's apartment is a fairly realistic depiction of a Manhattan apartment, which I can always appreciate in a show, and it served as the hub of many of the show's plotlines and shenanigans--and it even served as home for much of the cast at some point during the nine seasons. And here is Ted's apartment in 3D, in all its messy glory. The couch was the epicenter of the apartment, and while I could never compare it to the iconic couches of "The Simpsons" or "Friends," it has played a pivotal role in the show and became a trademark of the apartment. The messy environs are befitting of Ted's somewhat complicated, messy--but always hopeful--romantic life. Ted later briefly moves to a upscale apartment (below), but it retains many of the same elements as his original place. Ted's new apartment keeps a similar layout as his old place, just, well, nicer. There's still the brick wall with a fireplace behind the seating area, but with the additional of a staircase. The column adds a wonderful architectural element that Ted, an architect by trade, would likely have been very drawn to. I think it was a great mix of old Ted and successful architect Ted. Pardon the grainy photo, but this seemed the most fitting picture to show of oddly nerdy womanizer Barney Stinson's apartment. Being the iconic bachelor, his apartment is appropriately decorated in a dark color palette of black leather, chrome, and mood lighting. One of his most prized possessions--and one of the only "decorative accessories" in his living room--is his full-size replica of a Star Wars Storm Trooper, proudly displayed in a corner of his living room. This room is, simply put, an interior designer's nightmare. And the best for last: the infamous blue french horn that catapulted Ted and Robin's relationship. It made its debut in the premiere episode, yet remains one of the most iconic and memorable pieces of the show. And whoever chose that shade of blue just got it perfectly right. So here's to one of my favorite shows of the past decade: you've made me laugh, cry, and spontaneously sing "Let's Go to the Mall." You're one of the best crafted and smartly written shows on television today, and you've graced the television with one of the most entertaining cast ensembles ever assembled for a comedy. Thank you cast, crew, and everyone involved with HIMYM. You'll be missed. 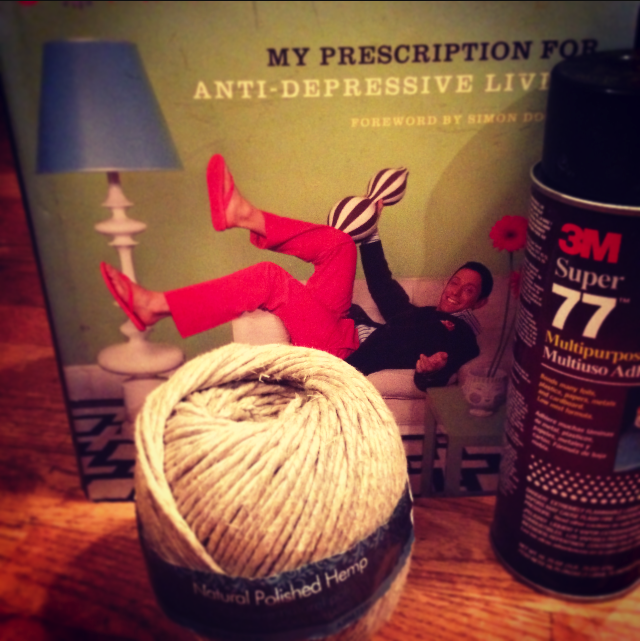 I have a well-documented love of Jonathan Adler. It is typically out of my price range, but I fortunately won a Trousdale Lamp in the set auction from "Ugly Betty" a few years back. It went for a ridiculously low price, and had the added bonus of being THE lamp seen in Wilhelmina Slater's office. It worked beautifully in my old bedroom (see below), but unfortunately just doesn't work too well as is in my new place. I couldn't bring myself to get rid of it, so did what is almost the unthinkable...I altered it. I decided I wanted to change the design in a manner that would allow for reversal, just to assuage my fears of altering it. I'd been thinking about the Rope Floor Lamp from Pottery Barn, so decided to emulate it by wrapping my Trousdale Lamp with a polished hemp rope I found at Walmart. I liked that it was thick and smooth, but still offered that raw, rustic feeling I was looking for. Using some spray adhesive and an abundance of patience, I wrapped the lamp, bottom to top. After many hours and about 3 rolls of hemp (almost 200 yards--what?! ), I had a lamp I'm relatively happy with. The blue shade unfortunately had to go, and my wonderful boyfriend found a shade at a garage sale for $5. Can't complain. Ta da!! My new and (I hesitate to say) improved Trousdale Lamp. Definitely a new look for it, and I can always remove the rope (ugh) if I need it to morph back to its beautiful sleek beginnings. I hope I didn't offend Mr. Adler or the design gods, but I think I did the best I could with what I had available to me and for the space the lamp has to live in for awhile. Leave any thoughts or questions in the comments below! A well-documented favorite show of mine, the CW's Gossip Girl, had the daunting (but supremely fun) task of creating the world of the top-tier echelon of New York City's upper East Side society. They had to reflect it in both old and young characters, in their clothes, living spaces, and everyday lives. The sets were done with exacting detail, and successfully reflect the elegance and class befitting the upper-East-Siders, and the grungy rocker-chic attitude seen in the Brooklyn-based characters. Below I've taken select photos from the sets surrounding the two primary female protagonists, whom fans of the show will affectionately know as "S" and "B." Let's begin with my favorite character, Blair Waldorf, and the sets surrounding her life. The Waldorf living room is a prime example of old-school Upper East Side luxury: the marble columns, checkered black-and-white flooring, spiral staircase, and muted color palette all play together to create the classic pre-war look. Modern touches are reflected in the lighting and egg chairs, but are in keeping with the muted palette so as not to distract from the classic look. The Waldorf's dining room sits off of the living room, carrying the same muted color palette and traditional pre-war look. The upholstered Phillipe Starck Ghost Chairs surrounding the dining table offer a fun modern nod to a classic piece. Blair's bedroom is a perfect reflection of the self-proclaimed queen bee. The lavender walls, Queen Anne headboard, pink linens, and highly-feminine accents are a nod to her extreme girlishness and immaturity, balanced out with the more modern and masculine pieces that show off her edginess and no-nonsense demeanor. 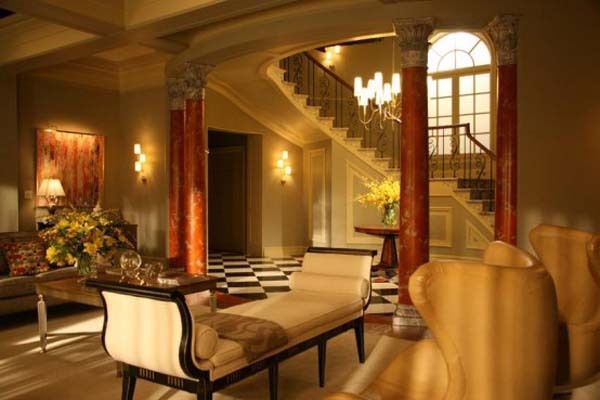 We now move on to the Van der Woodsen residence, home to Serena and her clan. While definitively modern and clean, their penthouse exudes wealth; richly colored accents set off very modular and clean pieces. 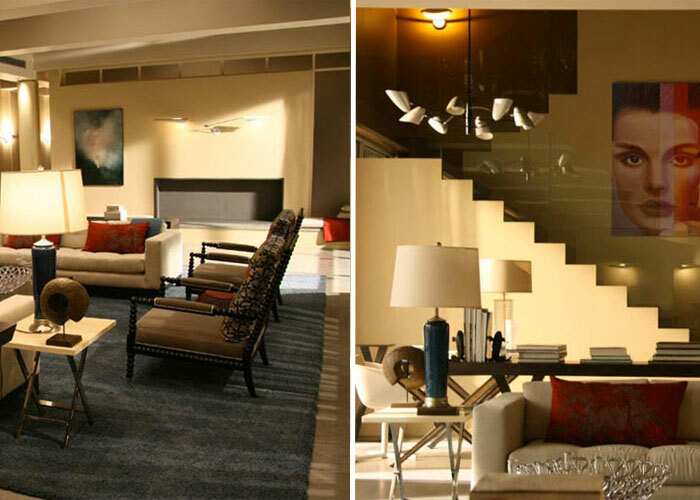 Their modern art collection fits perfectly in the museum-like space, flanked by the über-modern staircase and fireplace. This room is truly meant for entertaining, and the show takes advantage of this many times with countless fundraisers and cocktail parties providing the backdrop for endless juicy gossip and drama. 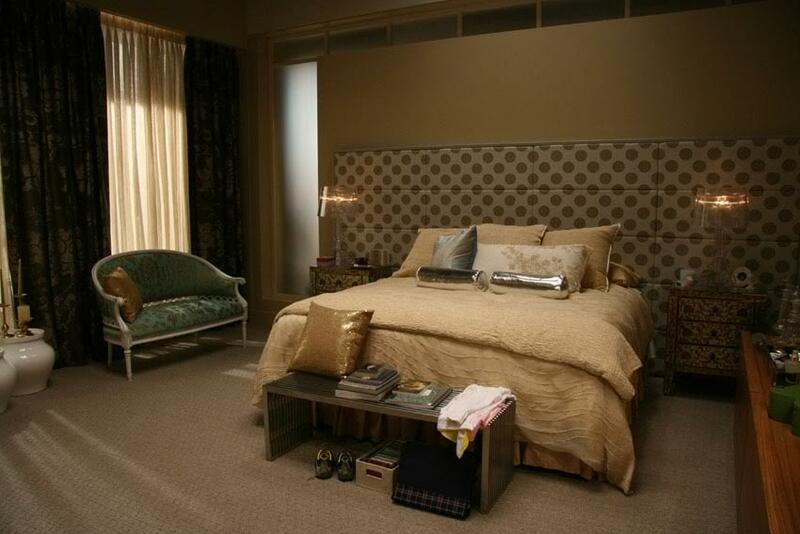 Finally, Serena's bedroom in the Van der Woodsen penthouse is a great pop-art-inspired room with classic nods. The polk dot upholstered wall, damask settee, and painted nightstands create an impactful trio of patterns, set off by muted bed linens and area rug. The Bourgie table lamps and metallic pillows are fun modern pops in the room that set off the intricacy seen in the settee and nightstands. The art-pop inspiration cannot help but remind the viewer of a Warhol-esque world that idolizes youth, glamour, and wealth--all traits embodied in the mysterious and fabulous Serena Van der Woodsen. While only a small portion of the vast world of "Gossip Girl," the above photos demonstrate the detail and attention paid to the creation of the sets. The mix of genres and pieces are richly layered to create a beautiful world that is simultaneously fantastical and believable. © 2018 Matthew Berthold Design. All rights reserved.